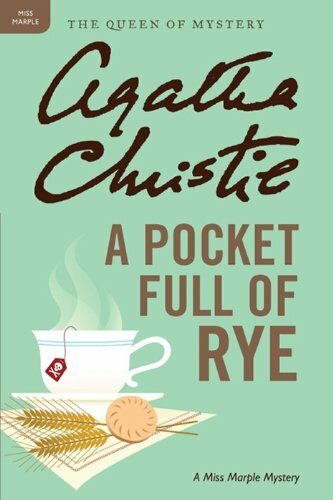 Last week I read A Pocket Full of Rye by Agatha Christie for a class I'm taking this fall called Murder on the Menu. It struck me how Agatha Christie, born in 1890, could come up with insights about people that seem so relevant today. Or . . . at least I think so. Do you agree? The mystery takes place at an English estate where the aging father is poisoned to death. His beautiful young wife meets a similar fate. And then the maid is found strangled outside the back door. When Miss Marple, Christie's famous detective, arrives on the scene she only knows what she's read in the newspapers. Since she's interested in finding out what really happened she interviews the local police inspector. "Newspapers," she tells him, "are often so sensational in their accounts. But hardly, I fear, as accurate as one might wish." Then she looks at the inspector. "If one could be sure of having just the sober facts." So . . . isn't that something we all want from today's hyped-up news outlets? Miss Marple was a wise old woman, who knew people and was very observant about their fears and ambitions -- which is what made her such a good detective. In pursuit of her quarry, she wasn't above trading some gossip. But after going on a bit about her hometown of St. Mary Mead she checks herself . . . "Oh, but I musn't gossip. Nothing is more boring than people talking to you about places and people whom you've never seen and know nothing about." Surely, you've been at a social gathering (as I have) and fallen victim to people reminiscing about . . . well people and places you've never heard of. Agatha Christie is right. It's a bore. Later on, the daughter-in-law tells Miss Marple, "Somebody in this house is mad, and madness is always frightening because you don't know how mad people's minds will work. You don't know what they'll do next." Does that remind you of someone in the news today? And is there method to his madness, or is it just madness? The plot turns to a large extent on what characters appear to be -- and who they really are, or who they think they are. Lance is the prodigal son who comes home to take his place in the family business. "Are you really going to become a city man?" the police inspector asks him. "It doesn't seem quite in character." Lance reminds him that he's his father's son. But the inspector points out . . . also your mother's. "You haven't got anything there," says Lance. "My mother was a romantic, out of touch with reality. I'm not like that at all. I have no sentiment, very little sense of romance and I'm a realist first and last." And the inspector responds, "People aren't always what they think themselves to be." "No, I suppose that's true," Lance admits. So . . . do you think it's true, that "people aren't always what they think themselves to be"? A little later on, the daughter-in-law talks about her second husband who committed suicide. "I began to realize about two years after we were married that Freddy wasn't -- well, wasn't always straight. I tried not to know what was going on. That was cowardly of me, I suppose, but I couldn't have changed him you know. You can't change people." And Miss Marple agrees, "No, you can't change people." So what do you think? Do people change? They mature, or some of them do. But do they really change? I don't know if I have answers to any of these questions. It's just interesting to me that they were being addressed by a prim and proper English lady almost a century ago. I love mystery stories ever since my Nancy Drew days. I thin it might be worth rereading some Agatha Christie. It's been years. In my time I devoured Agatha Christie, particularly Miss Marple but also the astute (and often irritating) Hercule Poirot, the oddly asexual little Belgian. Yes she was incomparable for her time and even today quite relevant. People don't really change and others' perception of our incomparable selves can be so at variance with our own.